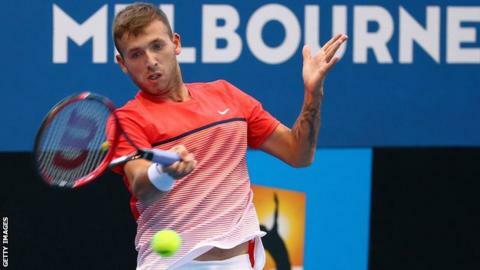 Dan Evans is one win away from the Australian Open main draw after beating Israel's Amir Weintraub 7-5 6-7 (4-7) 6-2. The Briton served four double faults when serving for a straight-set win, but won the decider 6-2. Evans, 25, plays American Bjorn Fratangelo next as he looks to join Andy Murray in the first round proper. Evans is the last Briton in qualifying after James Ward and Naomi Broady were both beaten in a chilly Melbourne. Broady was beaten 6-3 2-6 6-3 in round one by French world number 166 Alize Lim, while Ward lost 6-4 7-5 to American Dennis Novikov in round two. The Australian Open begins on Monday 18 January.